Planning for British diplomatic representation in Nigeria started several years before its independence in 1960. The Trade Commission moved in early 1957 into the leased ground floor of Kajola House, at 62-64 Campbell Street, and this office became the high commission office upon independence in 1960. Passport and Immigration sections later moved out to Western House, 8/10 Broad Street. The search for a site on which to build new offices began soon after independence. 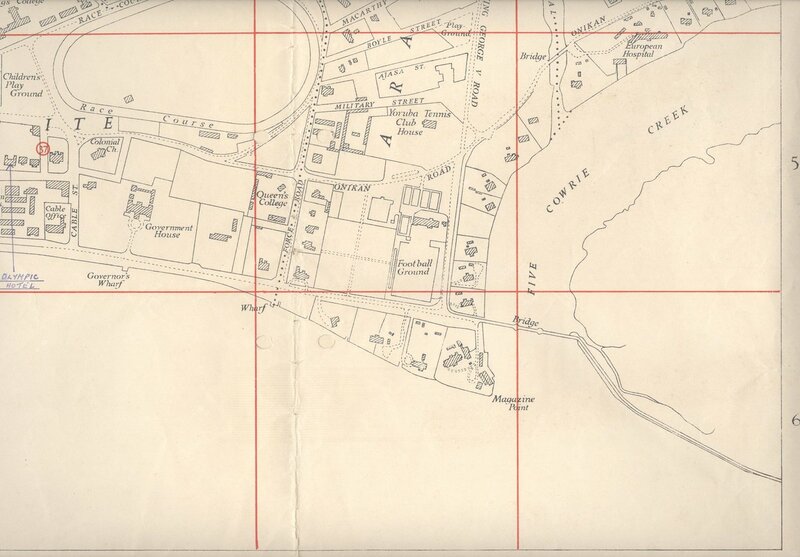 At one time, a site was considered at Marina, next to the residence site that was then under consideration. 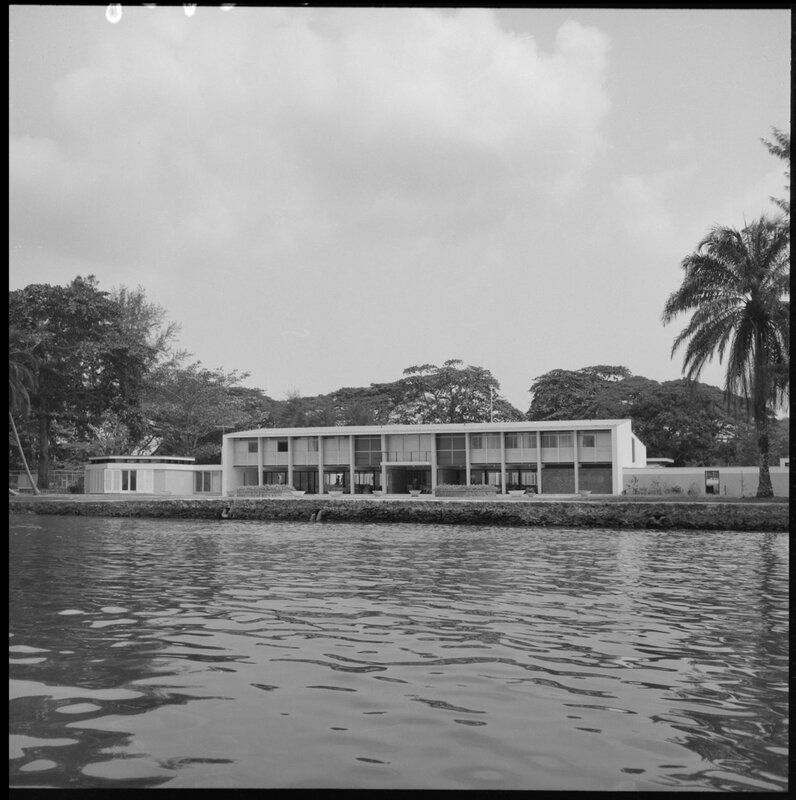 Later, Plot 5, Ahmodu Bello Road, Victoria Island, reclaimed from mango swamp, was leased for 99 years from 1963: its address later became 11 Eleke Crescent, and later Walter Carrington Crescent. For this site, Alan Wild, a PSA architect, designed a slightly meandering one-storey building through which rose a square block of two more storeys. 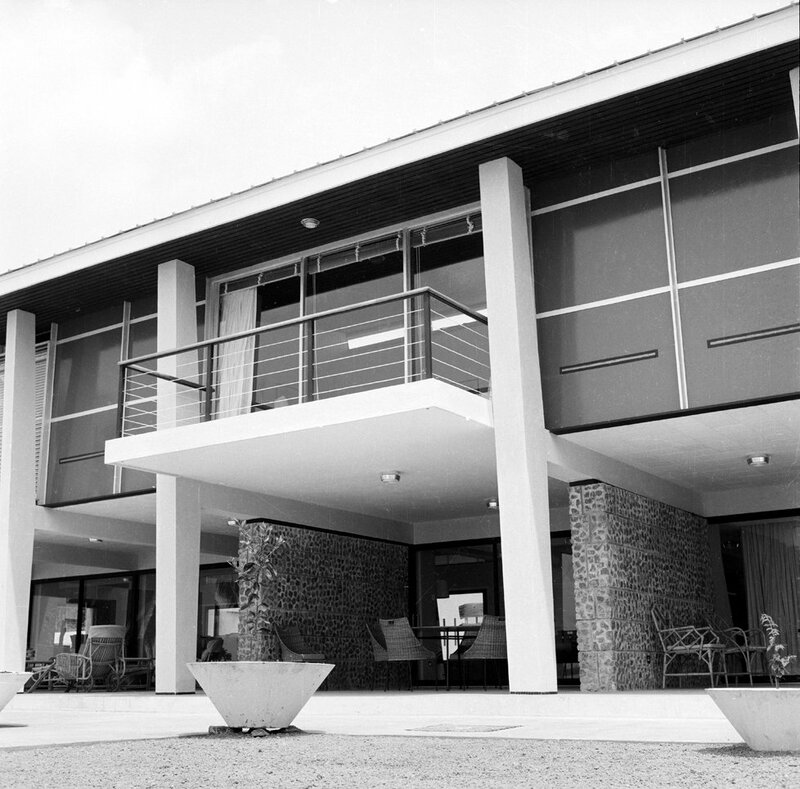 The ground’s loadbearing capacity was low, so the foundations for the central part were piled, the single storey parts rested on a reinforced concrete raft, and all the cladding was made of glass reinforced plastic panels to save weight: they were moulded in Britain, many of them with projecting fins for shading the windows. The resultant appearance was somewhat ungainly. The building was completed in 1977. 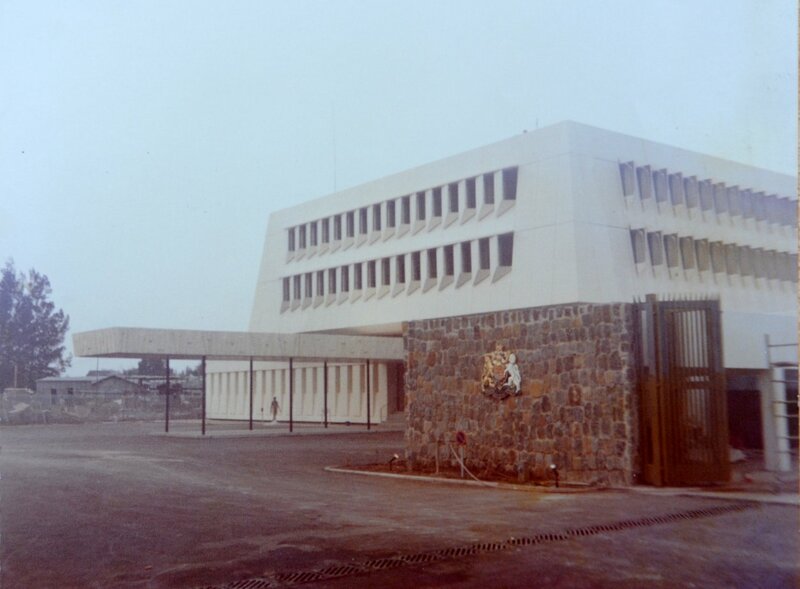 With the introduction of a visa regime in the late-1980s, the FCO readied a large visa-issuing facility in Awolowu Road which opened at the end of January 1987. 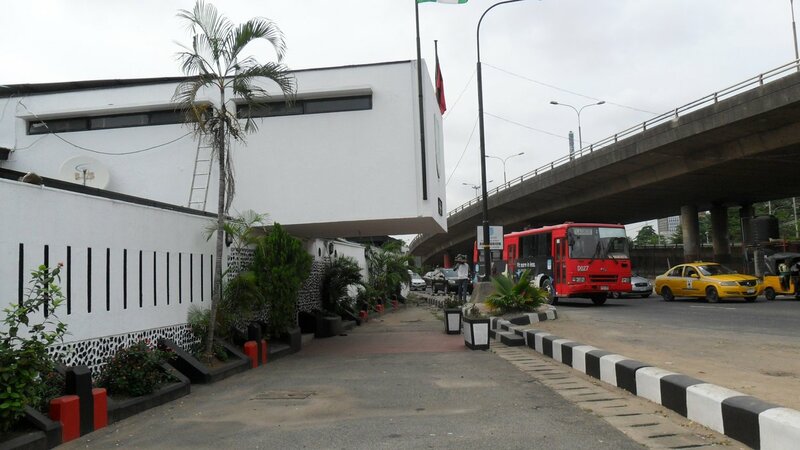 Two weeks later, the Nigerian authorities ordered its closure, giving 48 hours notice, because it was causing traffic chaos in an already busy street near the President’s office. Britain responded with immediate and complete closure, except for medical emergencies. A compromise was reached the following week. In consequence, the facility moved to the 7-10th floors of Chellerams Development House, later Wema Towers, at 54 Marina in November 1987. It remained in these leased premises until moving in June 1999 into a new building in the grounds of the offices at 11 Eleke Crescent. 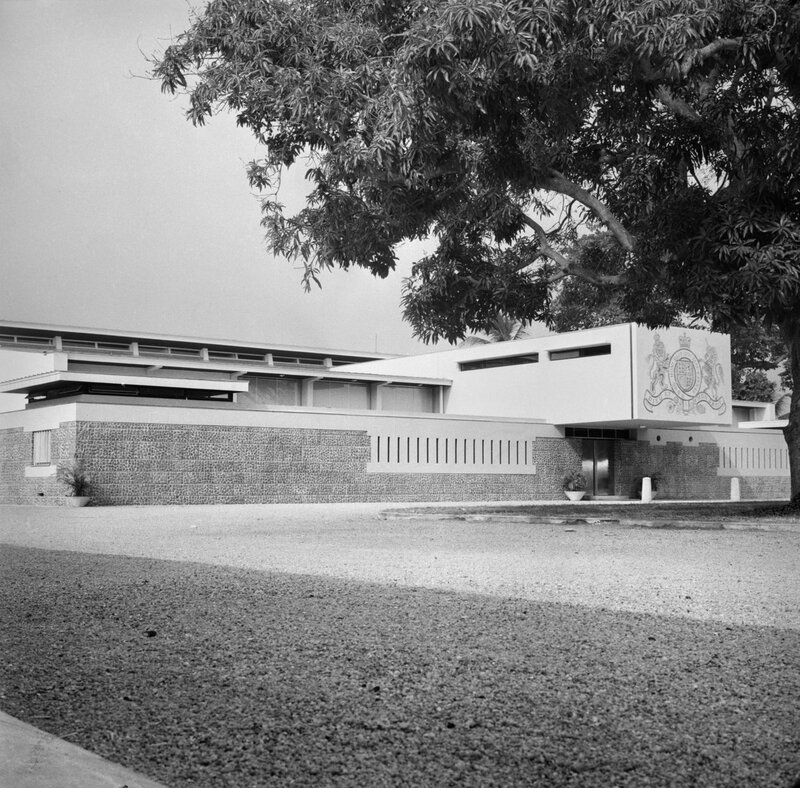 Prompted by the UK Trade Commissioner in Lagos, a senior Ministry of Works team, led by Richard Turner, assistant chief architect, visited Nigeria in August 1957 to consider possible sites for high commission offices and a residence in Lagos, and for deputy high commission premises in Enugu, Ibadan and Kaduna. The team’s brief from the Treasury instructed it ‘to enquire most carefully into the possibility of the Nigerian Government making houses available for H.MG.’s use after Independence’. The team looked at numerous possibilities, including such deals as swapping houses that were owned by the British government at the Tropical Testing Establishment in Port Harcourt for houses in Lagos. 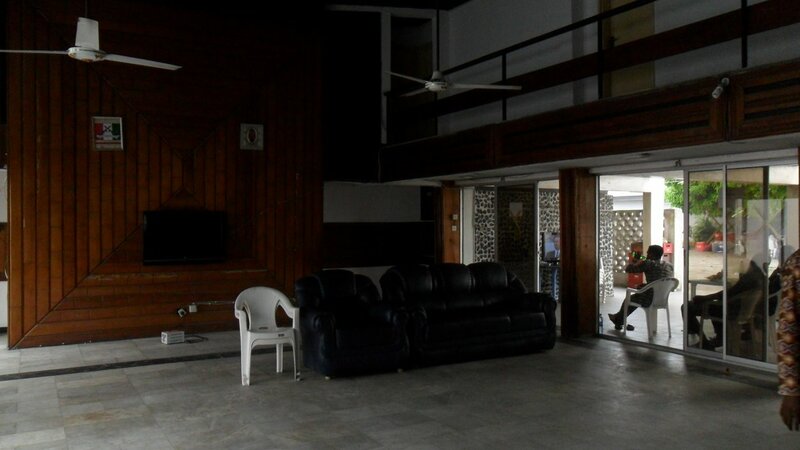 The colonial government turned down the team’s suggestion that the chief secretary’s house would make an excellent residence in Lagos for future high commissioners but later offered to release a comparable house and to present it as a gift. This offer was gradually reformulated, as successive houses were turned down as unsuitable, into the colonial government offering the combined sites of Nos.6, 7 and 8 Marina, in Araromi. Here, the British government could demolish the three buildings and design its own residence, which the Public Works Department would build: the offer also included a £40,000 contribution to the building costs. This was a hugely generous offer: Marina was the finest road in the city, and the site lay between it and the edge of the wide channel through which ocean-going vessels slid by on their way to and from Lagos port. No.6 was Flagstaff House, occupied by the general commanding the Nigerian military forces, and Nos.7 and 8 were occupied respectively by the directors of prisons and of inland waterways. The combined site of 1.36 hectares was large enough to accommodate an offices building as well, though it was intended to build only the residence before independence. The site offer was accepted in 1958. 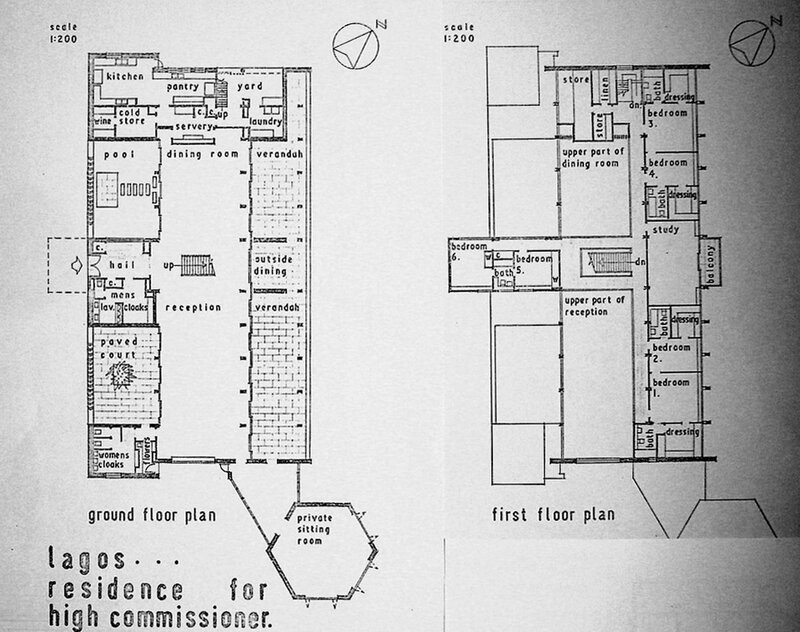 Architecturally, Brett’s was a rational and enterprising plan, and it was approved by the Commonwealth Relations Office. The side-lined Ministry of Works in-house architects withheld their counsel, although they must have suspected that the design was too domineering to stand a chance of suiting a succession of incumbents, and that it would be unworkable for large scale entertainment. The residence was built by an Italian firm, G Cappa Ltd, that bid £71,000, £19,000 lower than the next lowest tenderer, Taylor Woodrow. The contract was well under construction when Viscount Antony Head was appointed the first high commissioner. A former army officer and Conservative minister of defence, he was married to Dorothea, an accomplished portrait painter and the daughter of the ninth earl of Shaftesbury. They were very different from the senior colonial service couples who had briefed Brett on what they envisaged would be the requirements. Lady Head intensely disliked the ‘sort of concrete Design Centre’ that was being built and she was in a position to affect the outcome. Brett’s commission was terminated by the Ministry, the in-house architects took a grim satisfaction in finishing off the building, furnishing it more in sympathy with Lady Head’s Regency preferences, and adding a separate hexagonal pavilion as a properly private sitting room. 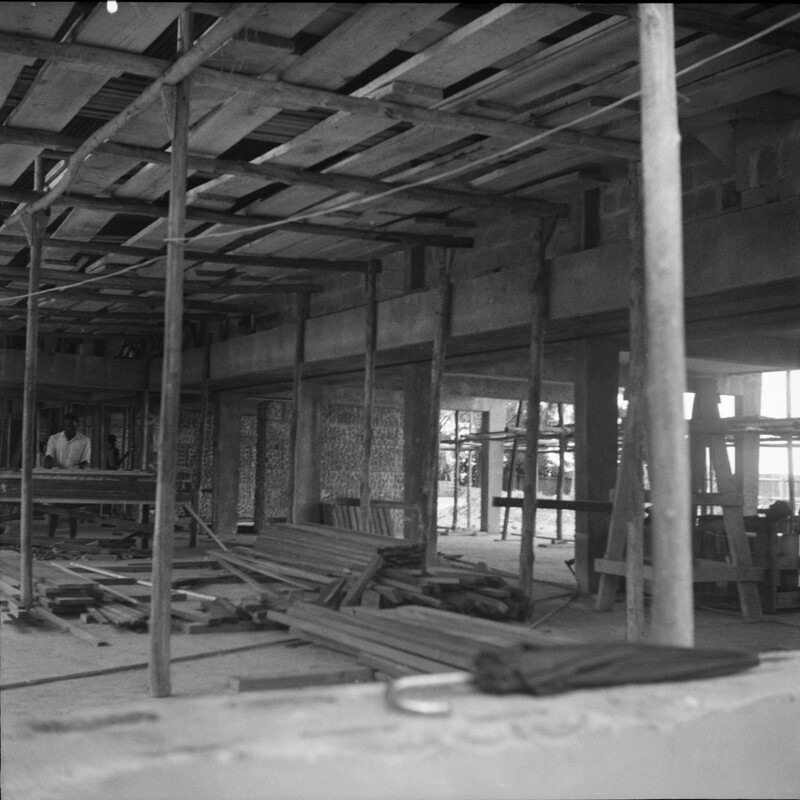 The building was occupied in January 1961, missing Independence Day by four months. 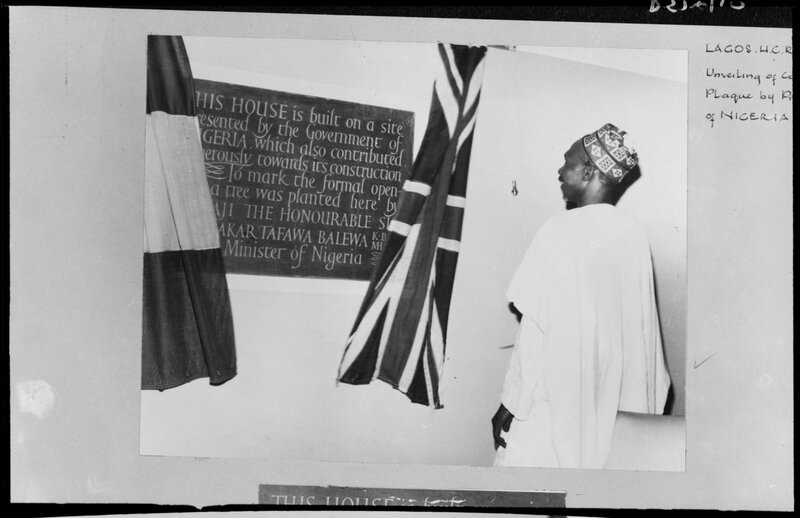 The prime minister of Nigeria, Sir Abubakar Tafawa Balewa, unveiled a commemorative plaque. The out-turn cost, including the adjustments by the Ministry, was £110,000. In the event, the house had only a short life as the residence of the British high commissioner. 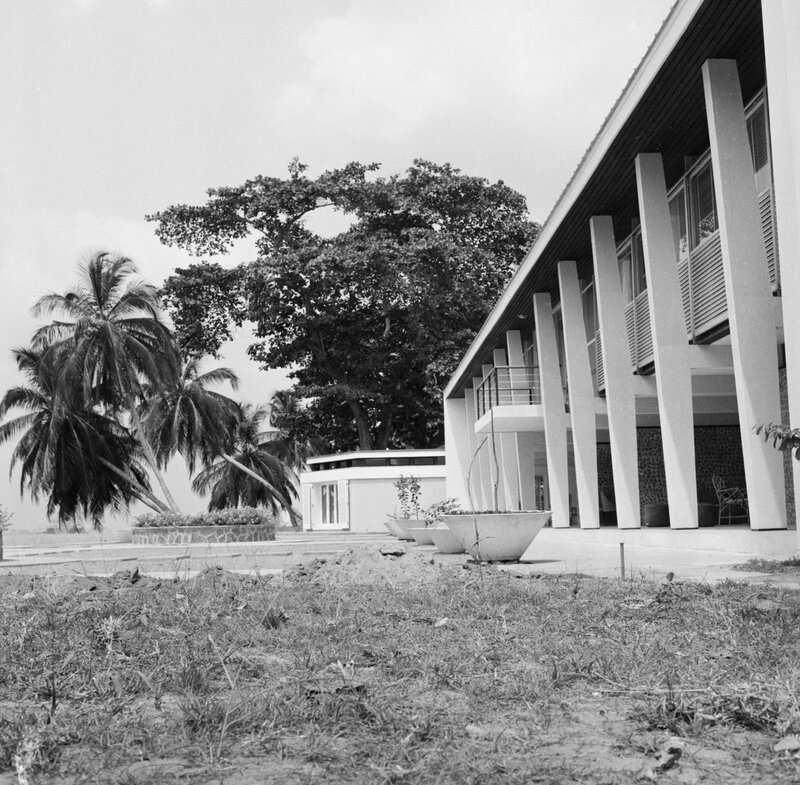 The Victoria Island Ring Road project was planned in the early-1970s and ran directly in front of the residence: its site was compulsorily re-acquired by the Nigerian authorities in 1976 and the house was scheduled for demolition. 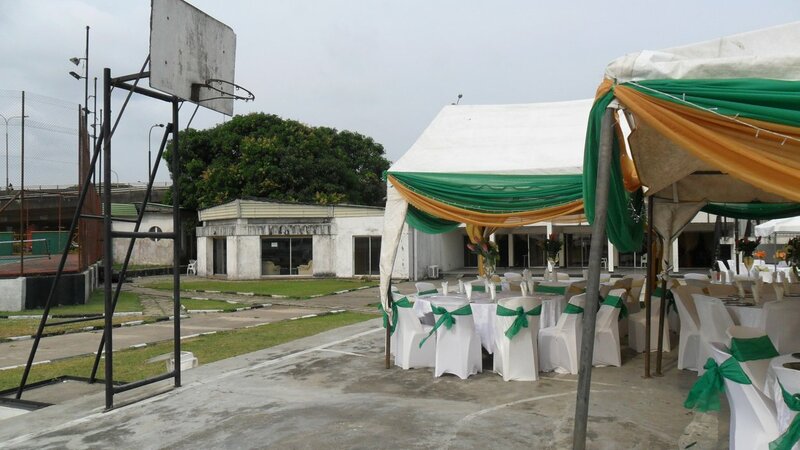 The high commissioner moved in June 1976 to an enlarged 3 Queens Drive (later called Oyinkan Abayomi Drive), a counsellor house on a 95-year ground lease from 1951, that was adapted to make a serviceable residence. The Nigerian government promised compensation for the vacated residence but it was not until 1990 that it offered £80,000, to which the Foreign Office, which had given up hope, agreed. The house (contrary to the assertion on p.344 of Room for Diplomacy) escaped demolition but instead became a Mess for the Brigade of Guards, barracked nearby. 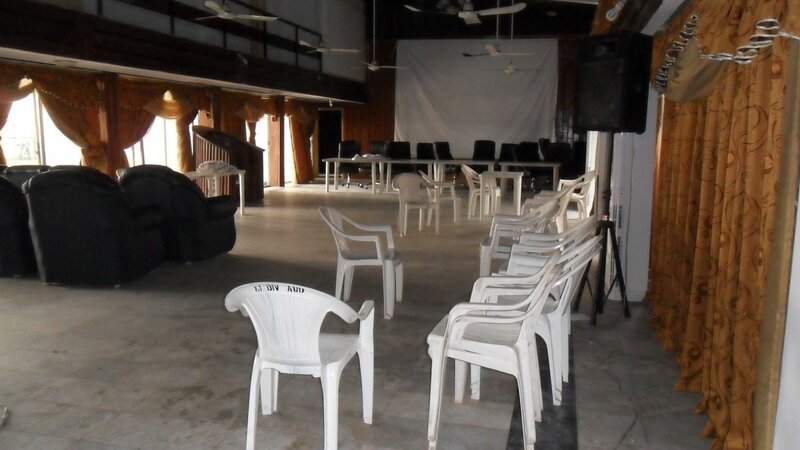 It is still in use as a venue for events, but appears to have lost all of its dignity and elegance. Lagos required a great deal of staff accommodation to be leased or built on leased land. 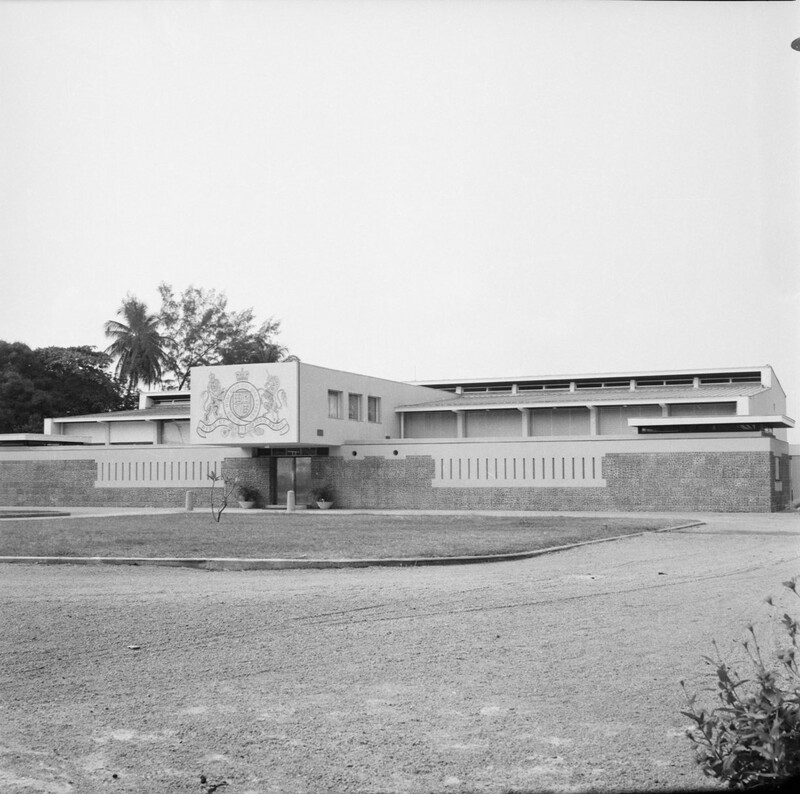 1 Bourdillon Road, 21 Ikoyi Crescent and 3 Queen’s Drive, were leased from 1947, 1948 and 1951 by other British government departments. The leases of another twelve or so houses were mainly taken between 1953-63. 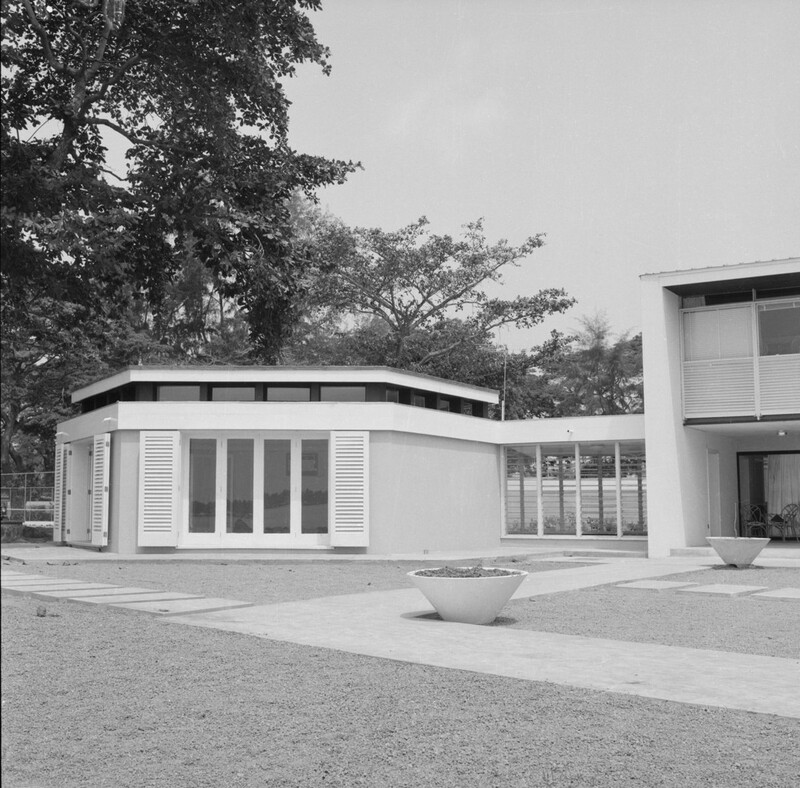 The deputy high commissioner’s house at 21 Ikoyi Crescent, designed by Ministry of Works architects in an idiom somewhat similar to the residence, was built concurrently with it at 21 Ikoyi Crescent by contractor Poletti Brothers. 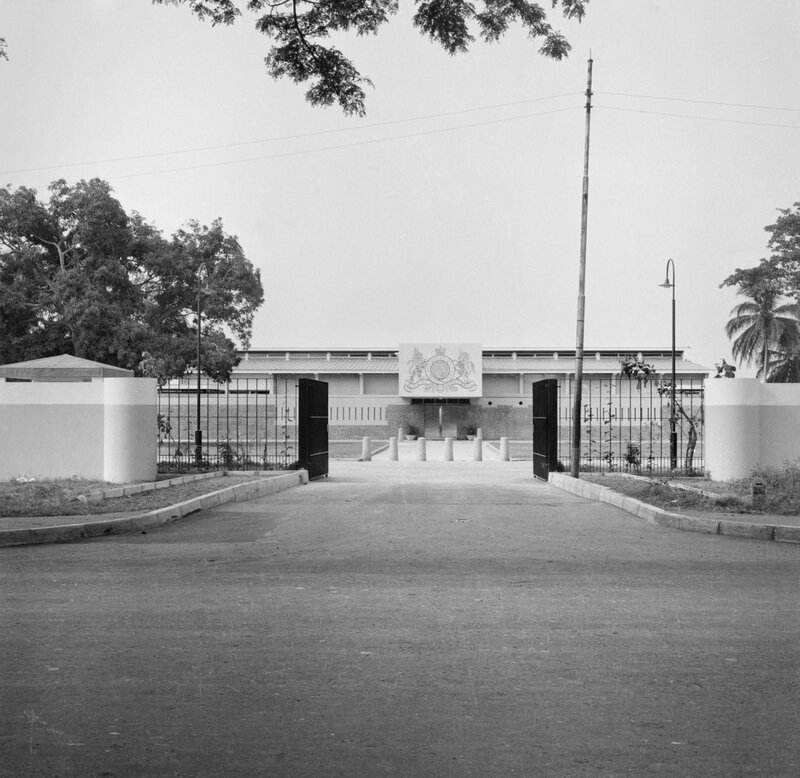 The Ministry of Works built 27 Cooper Road in 1953, and 55 and 57 Bourdillon Road for the Trade Commission senior staff in 1954. It also built four blocks of 6-8 flats at 4 Reeve Road, 41 Cameron Road, 42 Glover Road and Windermere at Kofo Abayomi Road. An amenity centre of club house, tennis court, squash court and swimming pool was part of the development at Reeve Road. I am indebted to Jill and John Godwin for their help with the house on Marina. 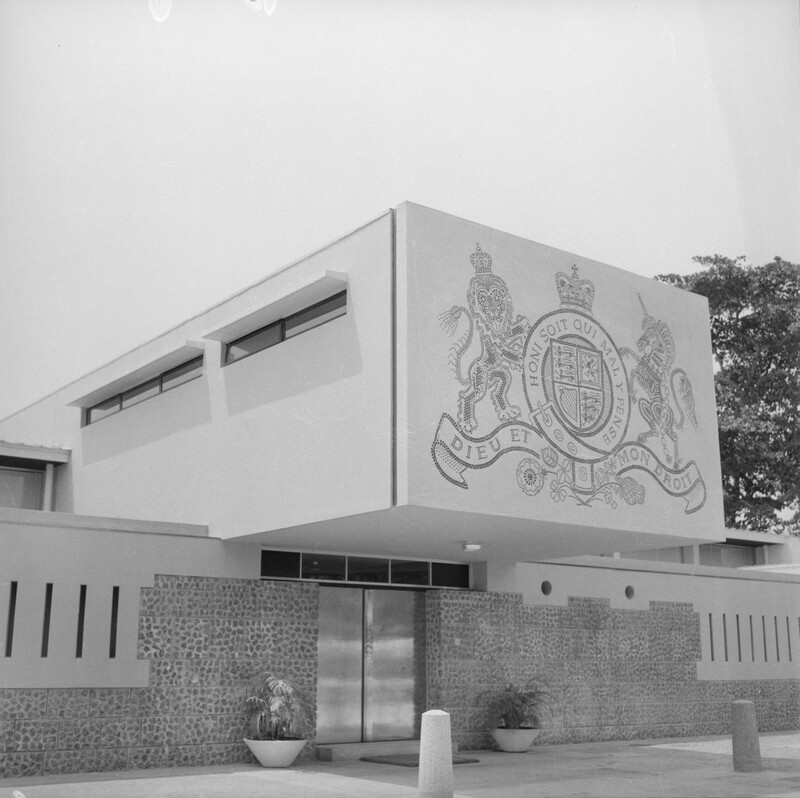 High commission offices, 11 Eleke Crescent, 1977. 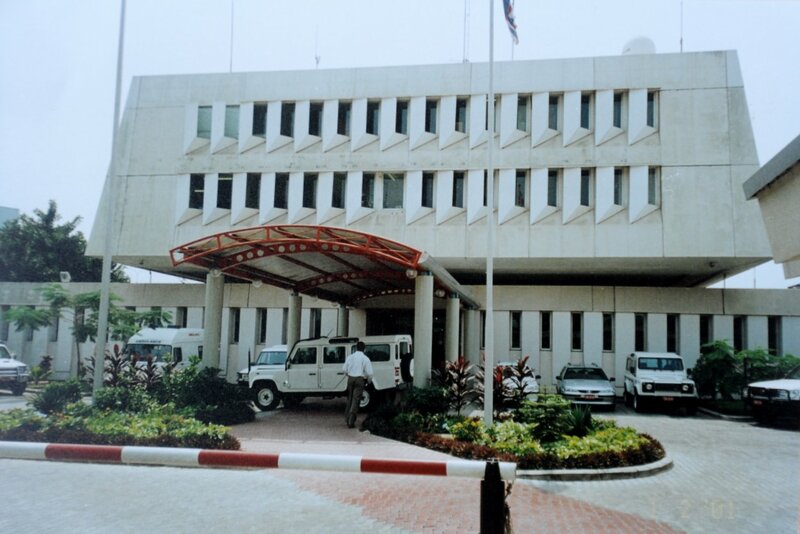 High commission offices , 1990s?. 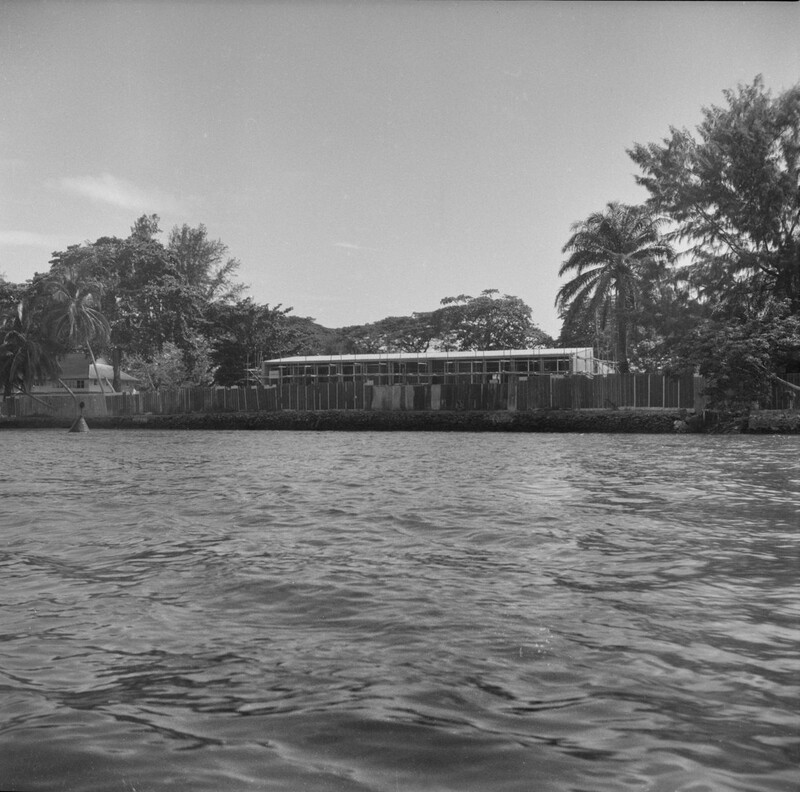 Flagstaff House, 6 Marina, seen from the Lagoon, 1957 (demolished 1959). 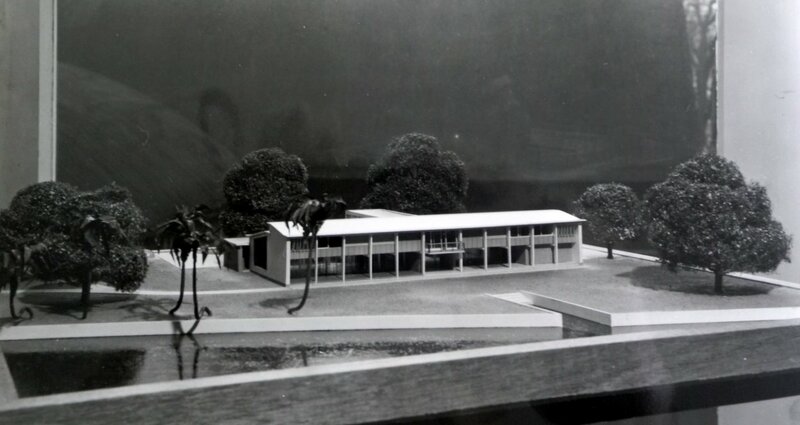 Model of Lionel Brett’s design for the new residence, 1958, with Lagos Lagoon in foreground. Schematic plans of new residence: ground floor on the left, first floor on right. Prime Minister unveiling plaque, 1961. Front entrance , seen from Marina, 1960. 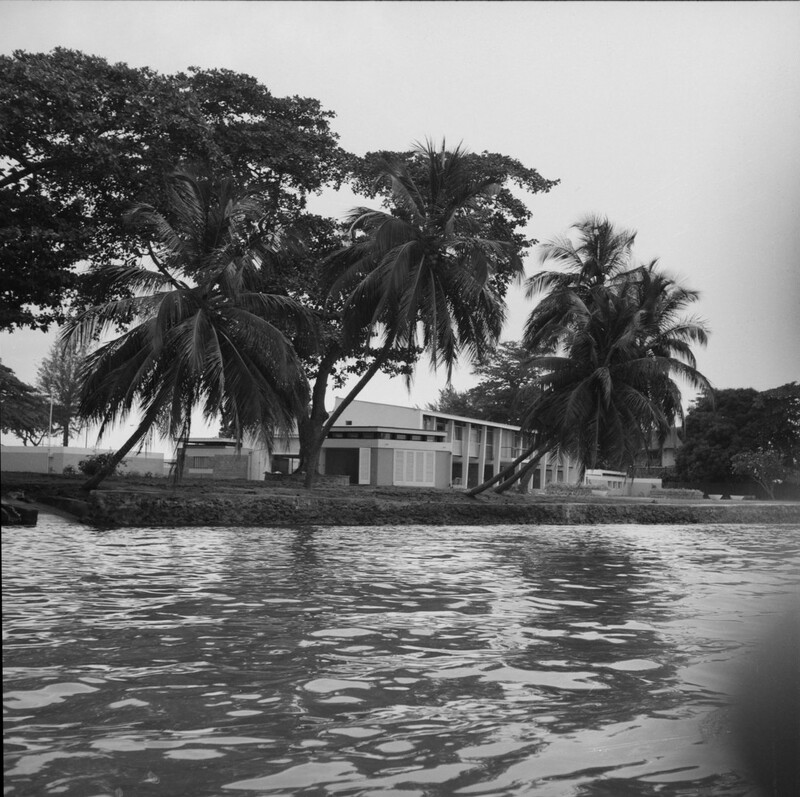 Residence from the Lagoon, 1960. 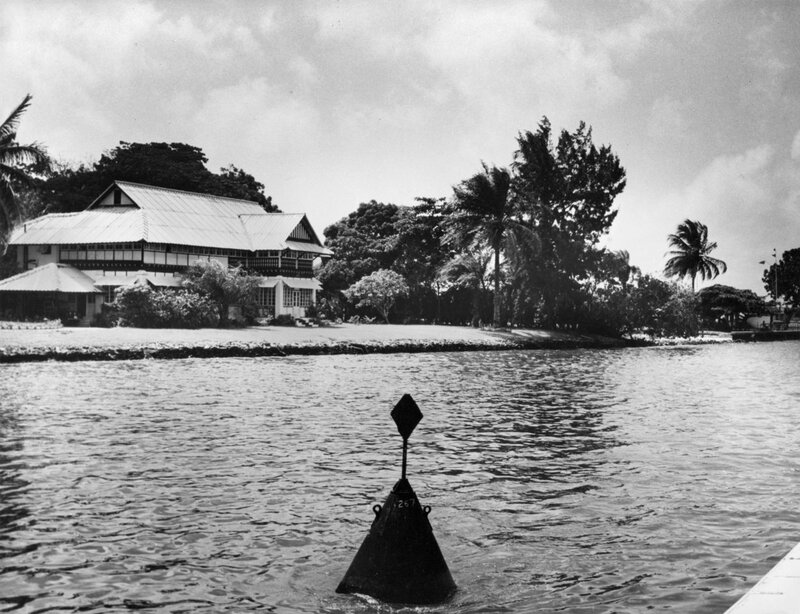 Centre part of lagoon frontage, 1960. 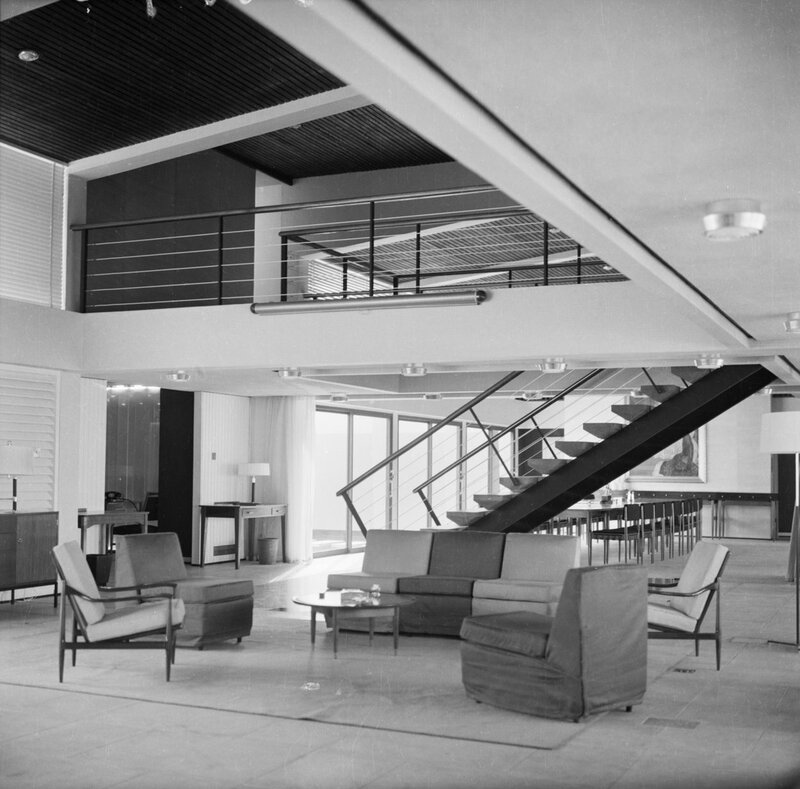 Reception area/drawing room, seen from the bridge, 1960. 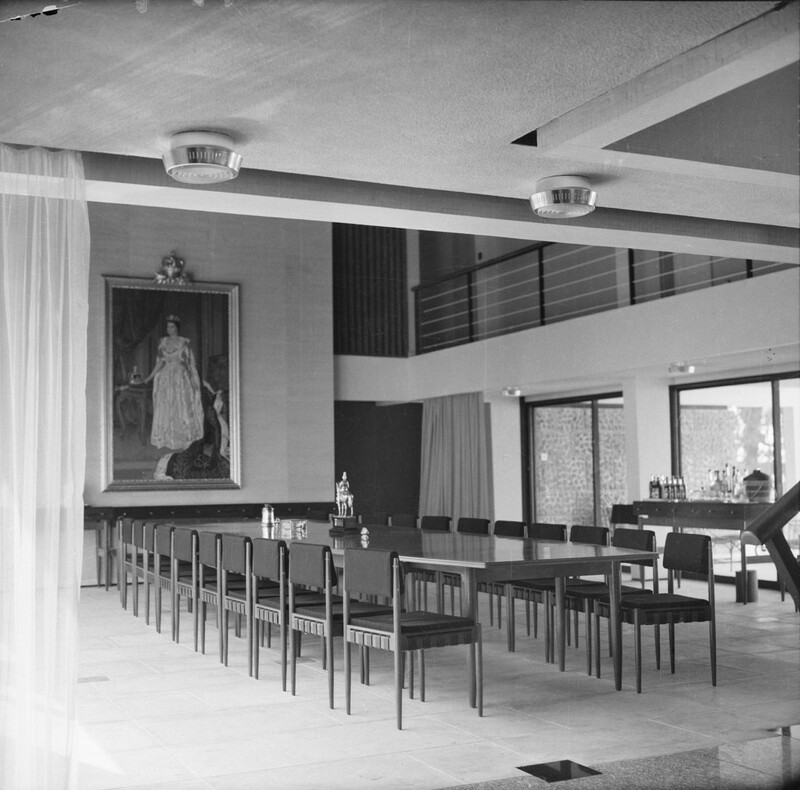 Dining room from entrance, looking towards terrace and Lagoon, 1960. 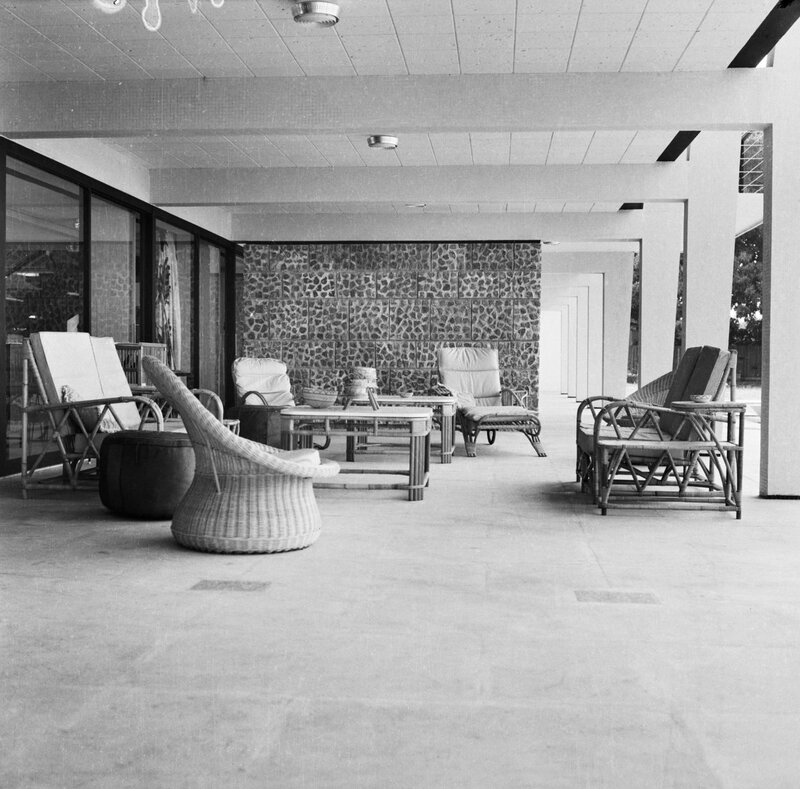 Terrace oiutside dining room, 1960. Hexagonal private sitting room survives today. Lagoon frontage, from west, 1960. Private sitting room, added by Ministry of Works, 1960. 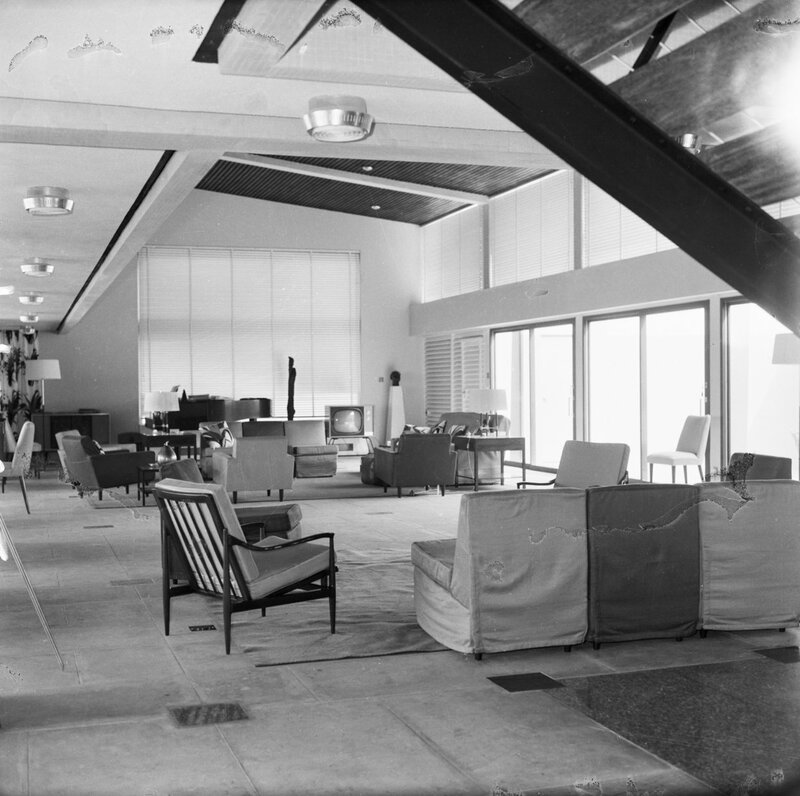 Drawing room area, from beneath bridge, 1960. 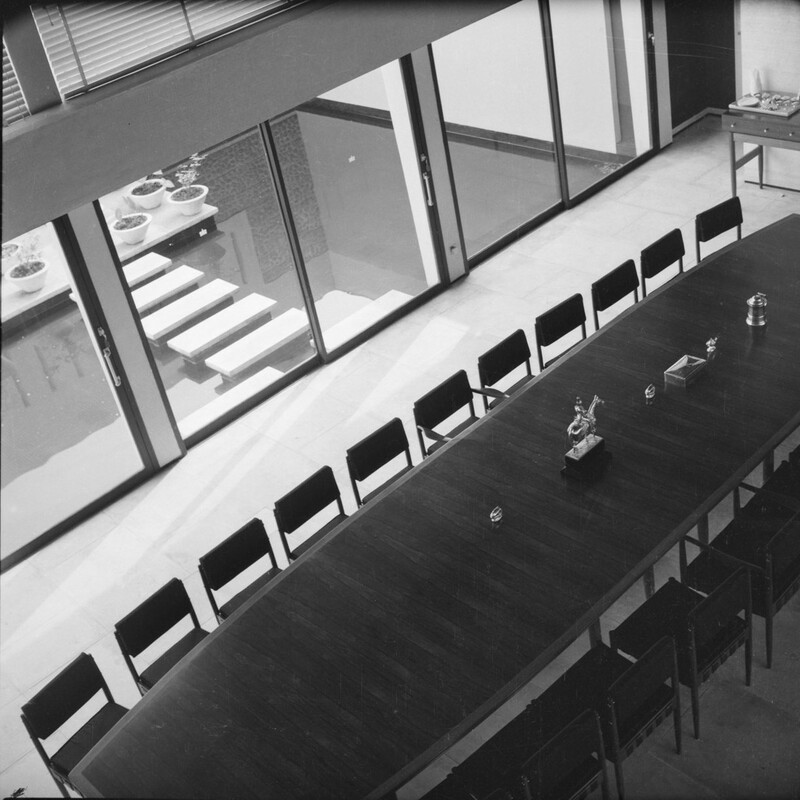 Looking down on dining room from bridge, with pool beyond, 1960. 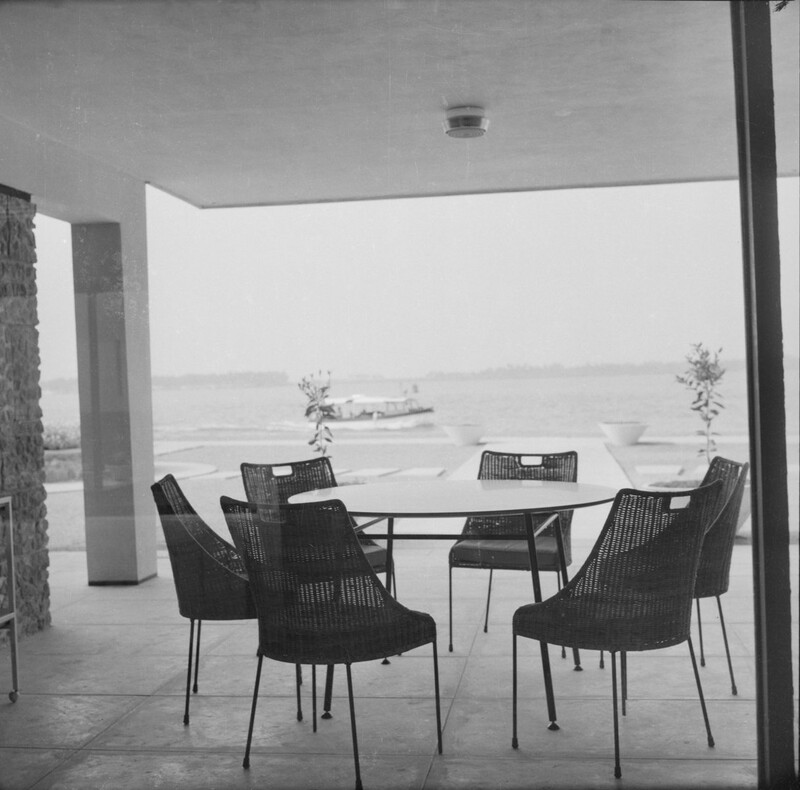 View of Lagoon, beyond breakfast/dining terrace, 1960. Drawing room area, in use in 2010. Coat of Arms over entrance, 1960. Lagoon frontage, from east, 1960. 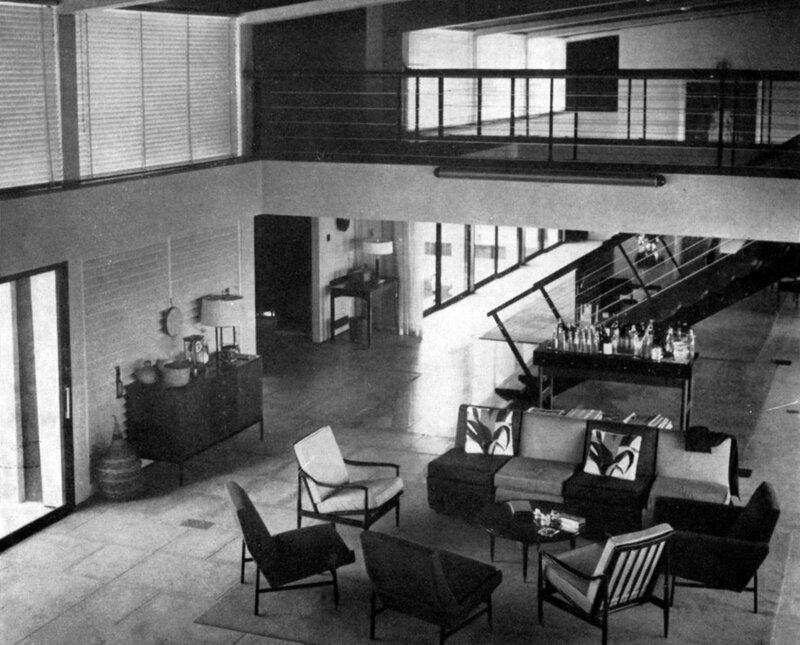 Interior of private sitting room, before furnishing, 1960. 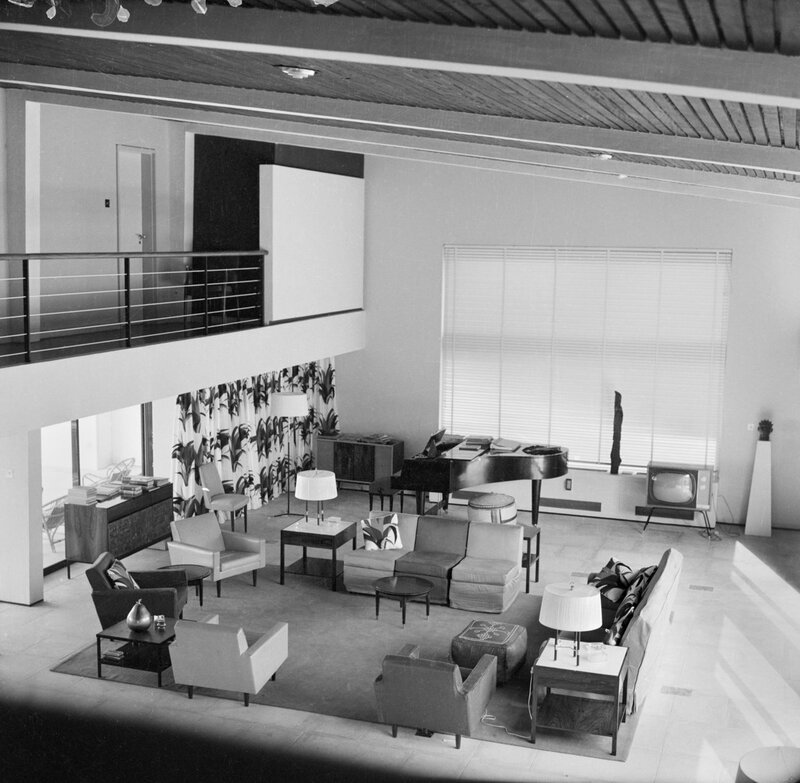 Looking from drawing room past stair and bridge to dining room, 1960. 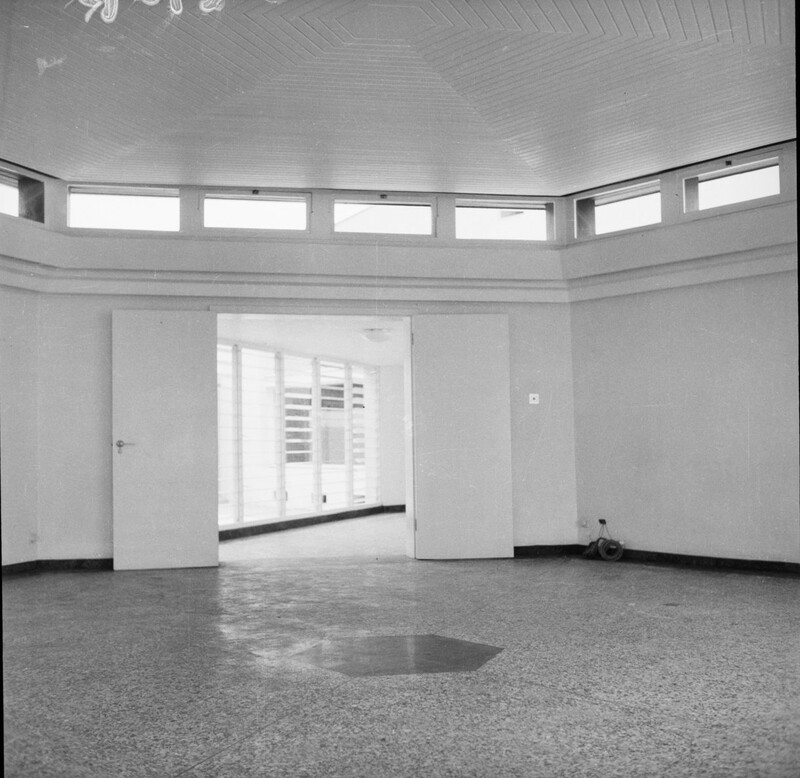 Looking down to entrance hall from first floor access balcony, 1960. 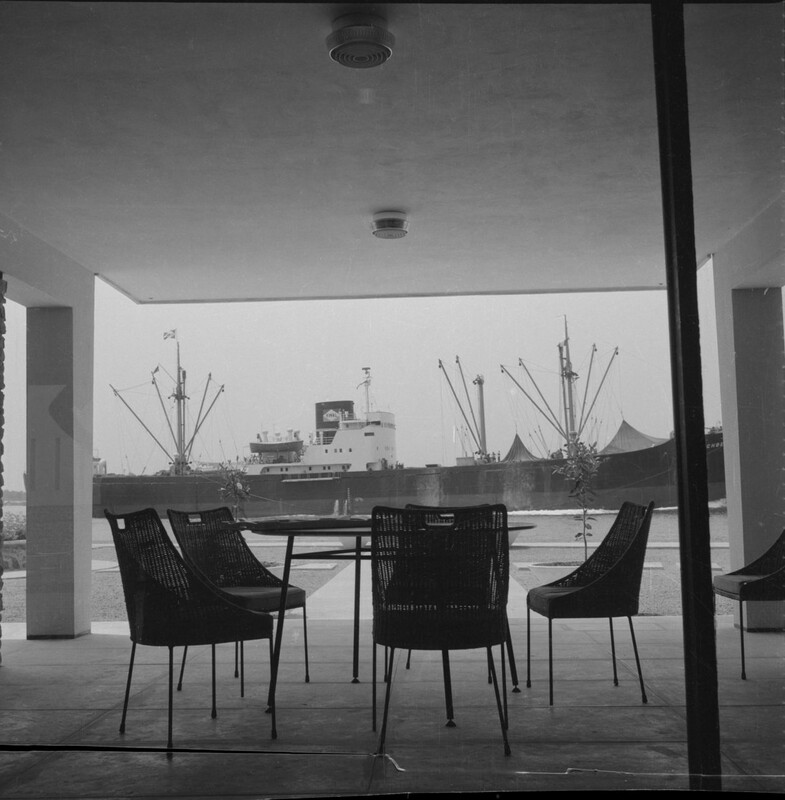 Shipping seen from the terrace, 1960. Dining room area, in use in 2010.